We are very pleased to announce the launch of our new website. Watch this space for news, announcements, and media buzz surrounding our exciting products. 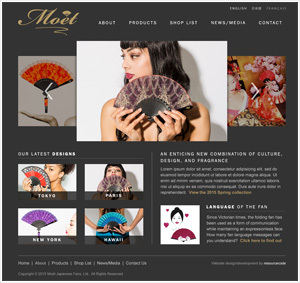 The Moet brand will continue to merge traditional Japanese craftmanship with modern style, bringing beautiful elements of historic Japanese culture into today’s fashion world. If you are interested in purchasing our products, don’t hesitate to contact our Customer Service Representatives at ＋81-3-6273-0084 (from 11 am to 7 pm, Japan time, Monday through Friday). We look forward to hearing from you!